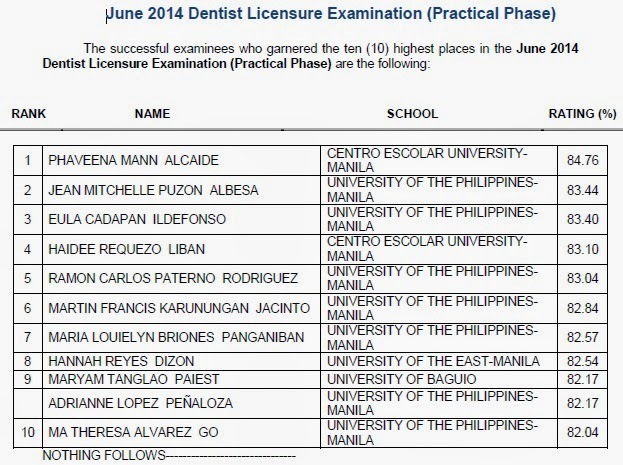 The Professional Regulation Commission (PRC) announced on Tuesday, July 1, 2014 the list of passers for June 2014 Dentist board exam. Phaveena Mann Alcaide, a graduate of Centro Escolar University (CEU)-Manila topped the board with 84.76 percent grade. University of the Philippines (UP)-Manila graduates ranked second and third with score of 83.44 and 83.40 percent grade respectively.